Shop Knowledge center Machines & installations Which types of spray nozzles are available? Which types of spray nozzles are available? There are different types of spray nozzles available for different use. It’s important to choose the right nozzle to get the best result because spray nozzels determine the volume, drop size and spray pattern. In this topic we will discuss different kinds of spray nozzles: Split top nozzle, Swirl nozzle and Floodjet nozzle. Basic Split top nozzle: this is the most common version. This nozzle is a relatively small drop en provides a uniform distribution of the spraying agent. Venturi nozzle: this nozzle provides bigger nozzles and they are filled with air. When the drops touch the crop they splash into smaller drops. This creates a better coverage on the crop. Swirl nozzle with hollow cone: this nozzle provides smal drops in a circle on the edge of the cone pattern. Swirl nozzle with full cone: this nozzle produces big nozzles in a circle. 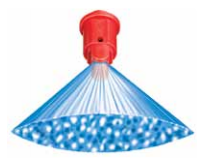 Floodjet nozzles give an ellipse way of spraying and are used with low pressure spraying. They have a wide angle of 160° and are suitable for big spraying volumes. For example used by Herbicides. The mist of the Floodjet nozzles contain both big and small drops. If you have any questions regarding different spray nozzles or you would like us to advise you, please contact our Product specialist Michael Visser or use the question form underneath. - How do you read a nozzle matrix?